Lakeshore Adventures offers so much to do in Door County, it will just amaze you! It amazed us at DoorCountyNavigator.com! Let your adventure begin right now as we look at kayaking, boating, charter fishing, zip lining and more! All in Baileys Harbor. You are going to enjoy this adventure! 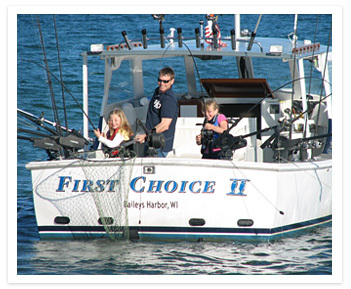 We spent a lot of time talking with Todd Haleen, the Captain of First Choice Charters and the owner of Lakeshore Adventures. Adventures are easy to find at Lakeshore Adventures - after all, it’s in their name! Lakeshore Adventures offers a fabulous zip lining experience nestled into the landscape of the Ridges Sanctuary in Baileys Harbor. With over 2,000 feet of excitement! And they use the best equipment, with the latest zip brake systems which is fully automated - safety first! 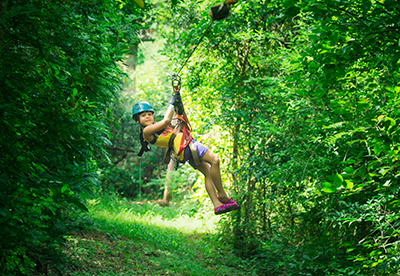 High quality zip line and camopy tours - even dual racing zip lines - all right here! Make a reservation now and enjoy this wonderful Door County experience! 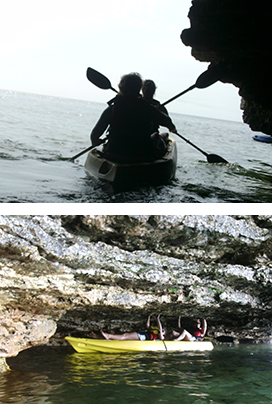 Kayaking Tours - Clear Bottom Kayaks! Go on a fully guided kayaking tour in Baileys Harbor. Glide through the clear waters near Cave Point and Baileys Harbor – you can see shipwrecks, lots of species of fish, rock formations (did you know that the rock formations of Cave Point are part of the Niagara Escarpment? Niagara – as in the Falls)! So choose from 4 selections of kayak tours: Times vary. These are generally 2 – 3 hours, and about $59 per person. Weather permitting of course. We can tell you, seeing the bluffs from the water (especially Cave Point) is special and beautiful. NOTE: Lakeshore Adventures has clear bottom kayaks so that you can just look down and see the fish and over 12 shipwrecks that are in the Baileys harbor waters - viewable through the hulls of their clear bottom boats! How cool is that? Kayaks, Pontoon Boats, Paddle Boards and Bikes! Want to create your own adventure? Well, at Lakeshore Adventures you can even rent kayaks, pontoon boats, paddle boards and now bikes too! Rent a jet ski – and they will bring it to a marina near you! How’s that for service! Call for a reservation for sure, and they will fit you with a life jacket, give you some tips and you are off. NOTE: if you were born after 1989, you will have to show a Boater’s Safety Certificate. Hey – you can rent a boat here too! Rent a 21 foot pontoon boat an have fun on the lake with a quality boat from Lakeshore Adventures. Not in Baileys Harbor will deliver your to any suitable boat ramp in the county just about (not Sturgeon Bay though)! Again, please NOTE: if you were born after 1989, you will have to show a Boater’s Safety Certificate. And yeah – they rent paddle boards and bikes too! They have it all! Captain Todd Haleen, born and raised in Baileys Harbor, or one of his top crew will take you out for some good fishing. Todd has 25+ years of charter fishing experience – so he knows where the fish are hiding. Catch some salmon as First Choice Charters will take you out on one of their almost 200 a season. All ages and all levels are welcome aboard! Call to reserve a spot. And yep – they do ice fishing too in the winters, and even fish processing. Want a fish recipe? You guessed it! They have those too! On top of all this, they have a shop too that specializes in kayaks and gear. Give the crew a call at Lakeshore Adventures and line up next set of adventures in Door County Wisconsin! And – please, tell them that DoorCountyNavigator.com you!